The San Jose Jr. Sharks youth hockey organization Sharks mission statement is to “Provide a fun atmosphere to foster a lasting love for the game of hockey while developing players on and off the ice, to create competitive opportunities in all appropriate age, skill and dedication levels, and to promote our players within the Jr. Sharks organization, to junior and college hockey.” To achieve this, the purpose of the Jr. Sharks will be driven by three major themes: develop, compete, and promote. Develop - field programs that allow kids at all age and skill levels to enjoy the game of hockey and to compete successfully at local, state, and national levels. Compete - provide a hockey development program that allows kids to achieve the highest competitive level of hockey that they can achieve. Participate in appropriate levels in NORCAL, CAHA, and USA Hockey Tier I leagues and tournaments. Promote – build a path for our players in which players can grow at their own pace and have an opportunity to play within the Jr. Sharks. The San Jose Jr. Sharks are a rink run program by Sharks Ice at San Jose. The operation of the Jr. Sharks is a joint effort between the hockey department and volunteers of the Jr. Sharks facilitated by the President of the club. The Hockey Department handles all core functions of the hockey operations including but not limited to hiring the coaches, monitoring the player development, scheduling of the games and practices, tournament operations along with bill collection and payments. The volunteers of the Jr. Sharks comprise the Hockey Council which handles the non hockey related functions such as banquets, alumni relations, and tournament volunteer support. The club also has a Hockey Advisory Board which works with the Club President in creating policies and the direction of the Jr. Sharks. San Jose Jr. Sharks home games are played at Sharks Ice at San Jose, located at 1500 S. Tenth Street in San Jose, California. Sharks Ice is the practice and training facility for the National Hockey League's San Jose Sharks. 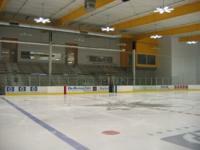 With four NHL-sized rinks, Sharks Ice is the largest ice hockey facility in the western United States. Sharks Ice at San Jose includes a pro shop, snack bar, and a full service bar/restaurant. Stanleys Sports Bar is located on the second floor overlooking three of the four rinks. Stanleys offer food, drink, pool tables, air hockey, and 11 flat panel televisions carrying major sports action. Please forward all sponsorship and advertising inquiries to Jr. Sharks Director Curtis Brown. The Jr. Sharks mission is to develop our players on and off the ice. Our membership benefits from knowledgeable coaches that train our players according to USA Hockey’s American Development Model and Long Term Athlete Development Principles. Each team’s program is tailored to the windows of trainability for their specific age and maturity. The Jr. Sharks experience includes off-ice skill, strength and conditioning along with practice ice and classroom discussion.